The examination of the fundus of the eye is a standard procedure for eye specialists. Anaesthesiologists, surgeons, neurologists, emergency doctors and rescue medics also rely on direct ophthalmoscopy. KaWe ophthalmoscopes prove themselves through their precise and shadow-free illumination of the fundus of the eye. With this unique technology - the wide aperture angle of the illumination optics - the examiner is able to see a large area while at a very close proximity to the subject. 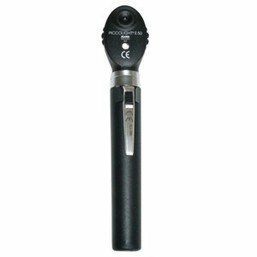 The ophthalmoscope heads of the PICCOLIGHT® have one or six apertures. The handles hold either standard or rechargeable batteries. Your own individual diagnostic set can be assembled entirely as you would like to have it.